y damage the organs, blood vessels and nerves in the body. 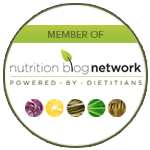 It is no surprise that good nutrition is a key way to manage healthy blood glucose levels. A healthy diet can help to prevent complications that can occur due to high blood glucose levels. These complications include kidney disease, foot problems, eye disease, heart attack, stroke, nerve damage, and problems with erections in men. While there is good information about diabetes and nutrition available, there are also many myths that, if followed, could interfere with your health. Learning the truth behind some common myths will boost your understanding of how food influences blood glucose management. Myth #1: You get diabetes from eating too much sugar, so diabetes can be avoided. Fact: There are different types of diabetes, and diet is only part of the equation. While many people associate diabetes with food choices, it is important to know that food choices and lifestyle are only a part of the equation. About five to 10 per cent of people who have diabetes have Type 1 diabetes, which does not come from eating too much sugar, or any other food. With type 1 diabetes, the body cannot make insulin. People who have type 1 diabetes must inject insulin via an insulin pen, syringe or pump. They must pay close attention to match the food they eat with the correct amount of insulin. This version of the disease is not preventable, and the cause is unknown. Scientists think it happens when the body’s immune system destroys cells in the pancreas that make insulin. About 90 per cent of people with diabetes have the form referred to as type 2. Just as no single food or nutrient can be blamed for obesity, eating too much sugar does not cause type 2 diabetes. In this type, the body does not make enough insulin, or cannot properly use insulin and is therefore considered insulin resistant. Glucose builds up in the blood as a result. 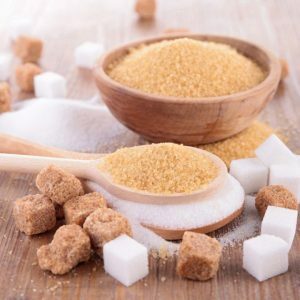 While sugar does not cause type 2 diabetes, the condition is managed through healthy eating and exercise, which can improve the efficiency of the insulin. Sometimes, medications or insulin are also used to help manage blood glucose. 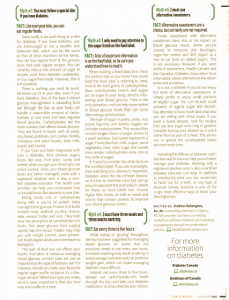 Some risk factors for type 2 diabetes cannot be changed. No one can control ethnic or genetic background, family history, or being over age 40. However, the risk does rise sharply if a person carries extra weight, especially around the mid-section. Myth #2: You must follow a special diet if you have diabetes. Fact: Like everyone else, you can eat regular foods. There really is no such thing as a diet for diabetes. If you have diabetes, you are encouraged to eat a healthy and balanced diet, which can be the same as that of other members of the family. You can buy regular food at the grocery store and cook regular recipes. You can certainly reduce the amount of sugar in recipes, cook from diabetes cookbooks, or buy sugar-free foods. However, this is not essential. There is nothing you need to avoid. All foods can fit in your diet, even if you have diabetes. 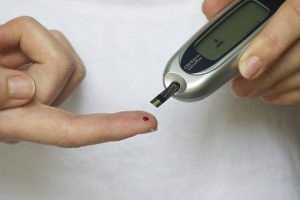 One of the keys in blood glucose management is spreading food out through the day so your body can handle a reasonable amount of carbohydrate at one time and best regulate blood glucose. Carbohydrates are the main nutrient that affects blood glucose. They are found in foods such as pasta, rice, bread, potatoes, corn, pulses (lentils, chick peas and dried beans), fruit, milk, and sweets. If you have just been diagnosed with type 2 diabetes, limit obvious sugary foods like pop, fruit juice, candy and sweets while you get your blood glucose under control. Once your blood glucose levels are better managed, work with a registered dietitian who is also a certified diabetes educator. 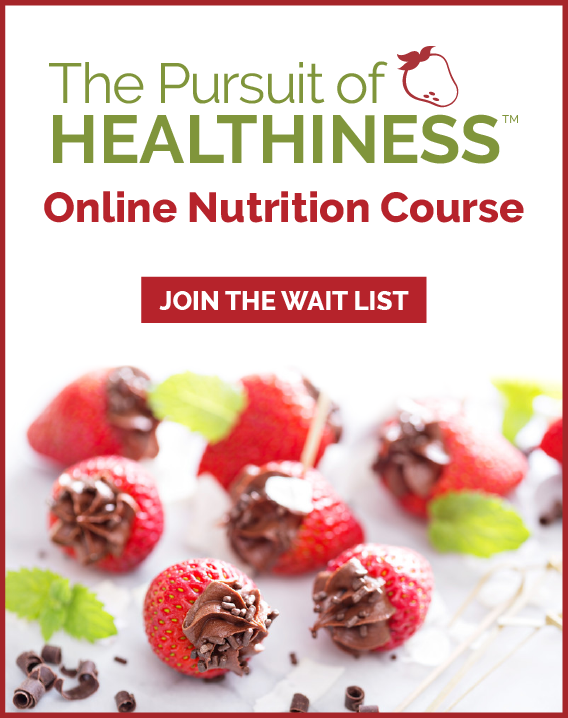 This health care provider can help you understand how to include foods like desserts in your diet. Eating foods rich in carbohydrate along with a source of protein helps manage blood glucose. Protein-rich foods include meat, seafood, poultry, cheese, eggs, peanut butter and nuts. They help slow the absorption of carbohydrate-rich foods. This stops glucose from surging rapidly into the blood. Protein may also help you with weight control, since protein-rich foods digest slowly and contribute to feeling full. The type of food you eat affects your health. And when it comes to managing blood glucose, portion sizes are just as important as the type of food you eat. For instance, should you bake your favourite regular sugar muffin recipe or try a low-sugar version? Whichever type you make, what is most important is that you have only one muffin at a time. Myth #3: I only need to pay attention to the sugar on the food label. Fact: A lot of important information is on the food label, so be sure you understand how to read it. When reading a food label, first check the portion size so you know how much food the food label is referring to. Next, look at the total grams of carbohydrates. Most carbohydrates (starch and sugar) act as sugar to your body, directly influencing your blood glucose. Fibre is the only exception, and can help lower spikes in blood glucose levels that can occur after eating carbohydrates. 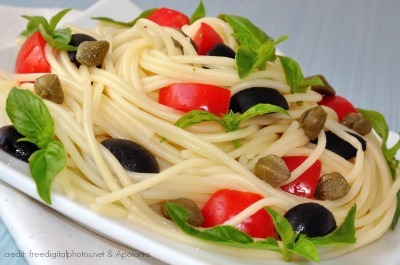 The type of sugar in grains, pasta, rice, bread, legumes and starchy veggies are complex carbohydrates. This means they contain longer chains of sugar, similar to a pearl necklace. Each pearl represents a sugar. Foods like fruit, milk, yogurt, some vegetables, beer, table sugar and sweets have simple carbohydrates (only one or two units of sugar). It is wise to consider the other facts on the nutrition label. If you are overweight, then watching your calories is important. Diabetes raises the risk of heart disease, so it is key to minimize trans fats and go easy on saturated fat and sodium. Watch for these on food labels too. Choose higher fibre foods, as well as meals and snacks that contain protein, to improve your blood glucose control. Myth #4: I must have three meals and three snacks each day. Fact: Eat every three to five hours. While eating throughout the day, or ‘grazing’ has been suggested for managing blood glucose, be aware that not everyone needs to eat every two hours. Constant snacking may result in taking in excess energy (calories) and can promote weight gain, which can make managing diabetes more difficult. Instead, eat every three to five hours. Spread out carbohydrate-rich foods through the day, and take your diabetes medication as prescribed by your doctor. Myth #5: I must use alternative sweeteners. Fact: Alternative sweeteners are a choice, but certainly are not required. Foods sweetened with alternative sweeteners have less or no impact on blood glucose levels. Some people choose to consume diet beverages, sugar-free sweets and diet yogurt as a way to cut back on added sugars. This is not necessary. 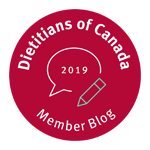 However, if you want artificial sweeteners, Health Canada and the Canadian Diabetes Association have information about alternatives like aspartame and sucralose. It is not a problem if you do not enjoy the taste of alternative sweeteners, or simply prefer to enjoy small portions of regular sugar. You can include small amounts of regular sugar and dessert. Pay attention to how much and what else you are eating with these treats. If you want a sweet dessert, look for recipes that use less sugar and icing in general. Consider having your dessert as a snack rather than as part of a meal. This allows you to spread the carbohydrate intake out over more time. Knowing the difference between nutrition fact and fiction can help you to better manage your diabetes. 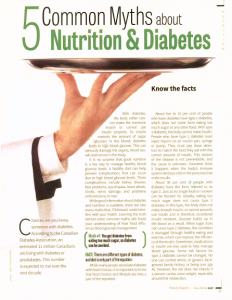 Working with a registered dietitian who is also a certified diabetes educator can help. In addition to monitoring what you eat, remember to head out for a walk, or any type of physical activity. Exercise is one of the single most effective ways to lower your blood glucose. WRITTEN BY: Andrea Holwegner, BSc, RD, a consulting dietitian in Calgary, AB. She provides nutrition counselling, workplace wellness initiatives and speaking engagements through her professional practice, contact her here.